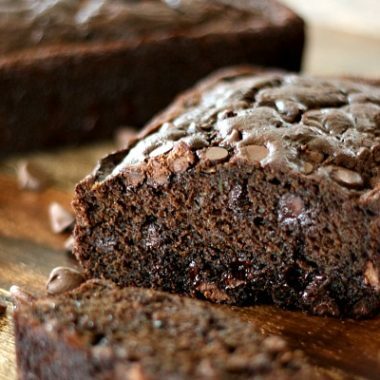 Chocolate Chocolate Chip Zucchini Bread is devilishly good! Preheat oven to 350 degrees. Grease and flour 2 8 1/2″ x 4 1/2″ loaf pans. Set aside. Grate or shred up enough zucchini to make 3 cups. Set aside. Beat eggs, honey, melted coconut oil, brown sugar and vanilla until smooth. Add in salt, baking powder, baking soda,cinnamon, cocoa and flour. mix well. Stir in zucchini and 2 cups of chocolate chips. Pour batter into prepared loaf pans and sprinkle remaining chocolate chips on top. Bake 60 minutes or until toothpick inserted into the middle comes out clean. Remove bread. Let bread rest in pan for 15 minutes. Run knife around the edge of pans to help loosen it. Remove from pans and let cool completely.